In the Assembly Chamber, votes are usually carried by a majority. When a motion is read, those in favour say ‘Aye’ and those against (contrary) say ‘No’. If it is unclear whether the Ayes or Noes ‘have it’, or if the apparent result is challenged, the Speaker rings the Division Bell throughout the buildings. 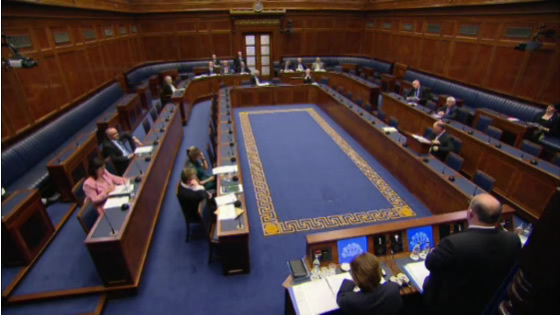 MLAs not already in the Chamber have three minutes to get there. The Speaker calls for another ‘voice vote’. If the result remains unclear, a Division takes place. Members enter either the 'Aye' or the 'No' Division Lobbies to register their vote. The Parallel Consent method requires 50 percent of all those voting and 50 percent unionist support and 50 percent nationalist support. The Weighted Majority method requires 60 percent of all those voting and 40 percent support from both nationalists and unionists. petitions of concern, allowing 30 MLAs to submit a request to the Speaker for a particular vote to be taken on a cross-community basis. Constituency Map View the MLAs currently elected in each constituency. Diary of an MLA Being an MLA is a busy job. Try the MLA diary activity for a taste of life as an MLA.